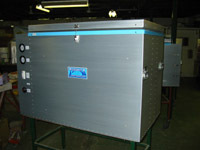 We first made the NRC 30-10 cabinet for the Rotary International Polio Eradication Program in Papua New Guinea in 1985. It was subsequently officially tested and approved by W.H.O. 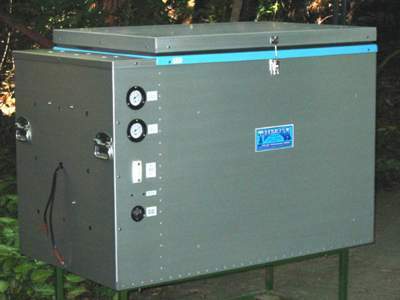 The NRC 30-10 cabinet was again retested and approved by W.H.O. in 1996 when we changed over to the CFC free refrigerant. Several thousand NRC 30-10 vaccine cabinets have been installed in many countries around the world over the past 18 years. The cabinet has two compartments, a 30 litre vaccine refrigerator and a 10 litre ice-pack freezer. This cabinet has two Danfoss BD35F compressors and a separate thermostat for each compartment and is therefore suitable for ice-pack freezing in mild temperature mountainous situations through to very hot desert situations. Combination 30L Fridge & 10L Freezer with two compressors. These cabinets are supplied packaged in wooden crates ready for export shipping. This cabinet has two compartments, a 120 litre vaccine refrigerator and a 30 litre ice-pack freezer. This cabinet has two Danfoss BD35F compressors and a separate thermostat for each compartment and is therefore suitable for ice-pack freezing in mild temperature mountainous situations through to very hot desert situations. 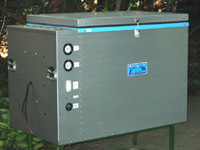 Combination 120L Fridge & 30L Freezer with two compressors.